The future of natural male enhancement has arrived! 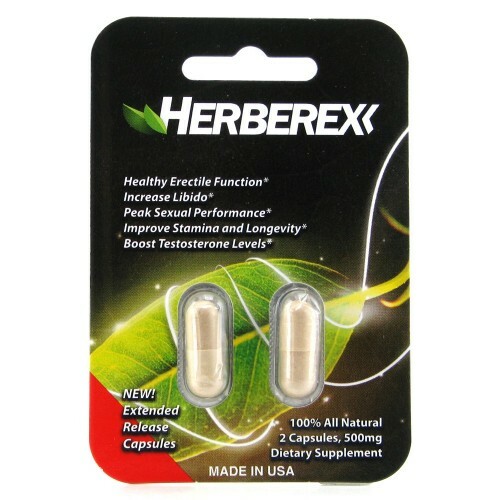 Herberex™ (urb-er-x) is an herbal, helpful, scientifically formulated, natural male enhancement pill which supplements the sexually beneficial nutrients that people consume in their everyday diet. As part of a healthy lifestyle, Herberex™ is designed to help contribute to long term, natural, erectile health with an added aphrodisiac effect to potentially enhance immediate arousal & erectile stimulation. Herberex™ is designed to potentially last up to 72 hours but mild enough to take daily*. As an herbal supplement, Herberex™ is available without a prescription. What are the benefits of Herberex™? Hundreds of reviews from our loyal customers and major retail websites across the country have reported that Herberex™ is one of the top male enhancement formulas on the market. Customer feedback and repeat orders indicate that Herberex™ works for a majority of our customers. Herberex™ ingredients are backed by clinical trials, years of nutraceutical research and is reputed to have androgenic-like results that rival its pharmaceutical counterparts*. Herberex™ offers a 90 day, No Questions Asked money back guarantee. So don’t take our word for it, try it for yourself. Does Herberex™ have side effects? With Herberex™ you can enjoy all the potential benefits without the negative side effects. Herberex™ is formulated to last up to 72 hours but mild enough to take daily*. Most users do not experience the intended effects of Herberex™ until engaging in sexual activity. Herberex™ is made with 100% all-natural, high quality ingredients. To ensure the safety and quality of our product, we manufacture Herberex in a cGMP certified facility. The GMP certification program is based upon third party inspections and comprehensive audits in all areas of production and manufacturing. This program ensures that all elements of the manufacturing process are reviewed to provide assurance that safety and quality is built into products during manufacture. Every ingredient is analytically tested for chemicals, heavy metals, pesticides and common male enhancement steroids. Every batch holds a certificate of analysis with these results. Herberex™ is pre-registered with FDA, Canada Health Board and European Health Board for importation. Herberex™ hand selects high quality ingredients from the leading global suppliers. What separates our ingredients from the competition are patented, innovative extraction technologies, standardization and harvesting techniques that produce higher bioavailability and consistency in every batch.